Florida Non-black Brazilians are people from Brazil living in the United States of predominately white or Spanish/Portuguese ancestry sampled in the state of Florida. White Brazilians make up 48.4% of Brazil’s population. 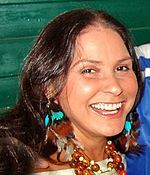 Photo: Fafá de Belém, born Maria de Fátima Palha de Figueiredo in Belém do Pará on August 9, 1956, is a Brazilian singer considered one of the great female singers of popular music in Brazil.